The Earnings Expectations Gap – 18% worse off than expected by 2013? Please click on graph for larger image. With the latest inflation figures and earnings growth being announced this week there has been a lot of talk about the squeezing of real incomes. A few weeks ago I put together this graph but hadn’t got round to publishing it. The graph shows the trend in average real earnings (the black line) based on earnings growth less the CPI measure of inflation since 2000. I used CPI to reflect buying power though some might suggest RPI would be better to reflect total living costs. However I suspect the story would be similar. The future data is based on the May Bank of England quarterly inflation report and I have assumed earnings growth of 2.5% per annum for the next two and half years. 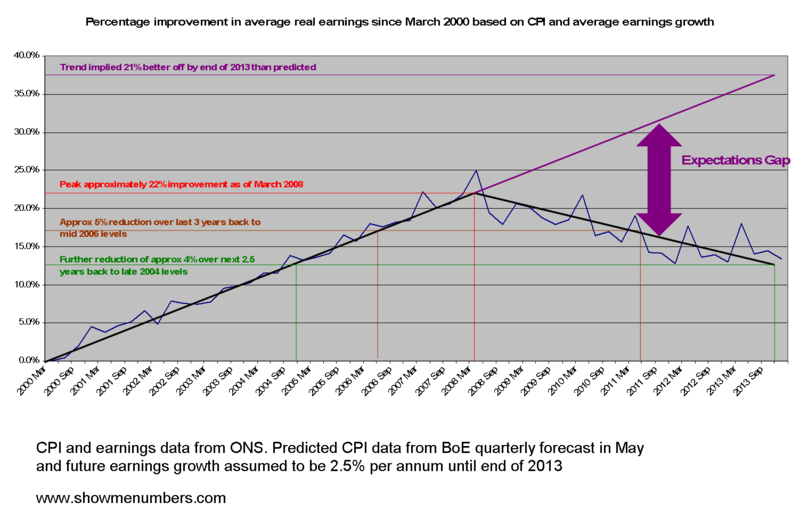 You can see that the trendline steadily rises to a peak in March 2008 when on average we were around 22% better off apparently than eight years before. Since then things have gone rapidly south. The graph estimates we are about 5% worse off now than in March 2008 and will be a further 4% worse off by the end of December 2013. In fact by the end of December 2013 the analysis predicts we will be only as well off on average as we were at the end of 2004, nine years earlier. But worse still is the “Expectations Gap”. This represents the difference between what we would have expected had the pre recessionary trend continued and what we are actually likely to experience. This gap says we are 11% worse off now, and will be 18% worse off at the end of 2013 on average than we expected to be. No wonder it feels so painful.